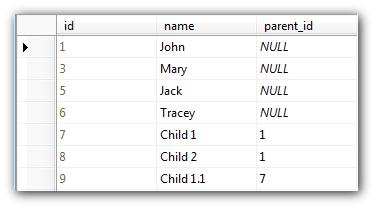 The parent_id column points to the parent resource (id column of the same table). It is necessary to allow the resources tree using TreeEnabled property (TreeEnabled="true"). You should specify the tree node images using TreeImageCollapse, TreeImageExpand, and TreeImageNoChildren properties or by using a theme (CssClassPrefix="scheduler_silver_"). It might be necessary to increase the row header width using RowHeaderWidth property.